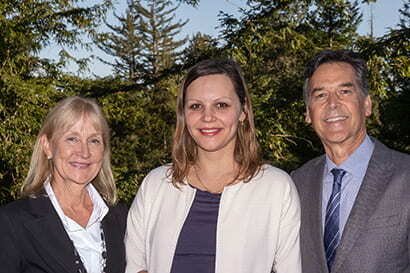 Olena Morozova Vaske, assistant professor of molecular, cell, and developmental biology at UC Santa Cruz, was honored as the inaugural holder of the Colligan Presidential Chair in Pediatric Genomics in an investiture ceremony on Tuesday, February 19, at the University Center. The chair was established in 2016 with a gift from John “Bud” and Rebecca Colligan and matching funds from the UC Regents. The initial focus of the chair is to advance efforts to use genomic data to defeat childhood cancer. Vaske cofounded the Treehouse Childhood Cancer Initiative when she was a postdoctoral researcher working with David Haussler, professor of biomolecular engineering and director of the UC Santa Cruz Genomics Institute. She maintained her involvement in Treehouse during a postdoctoral fellowship in clinical molecular genetics at UCSF, then returned to UC Santa Cruz in the fall of 2018 to join the faculty of the Department of Molecular, Cell and Developmental (MCD) Biology.